Have you ever opened the door to come into the house and it only opened part way because there was stuff behind the door? You know how you push on the door but it can only go so far? So you walk in and then stumble over the pile of shoes that were kicked off and left there. You look around and see the source of chaos and morning meltdowns. How many items can you spot that do not belong there? The boots that your kid grew out of 2 years ago, water bottles dropped there after last Saturdays soccer game, many mismatched socks, the diaper bag with most likely dirty cups and bottles inside and all of that sporting equipment that belongs in the garage. Why exactly did someone carry their roller blades in the house? Let’s discuss the mudroom or entryway and all that stuff that prevents a smooth transition from outside to inside. 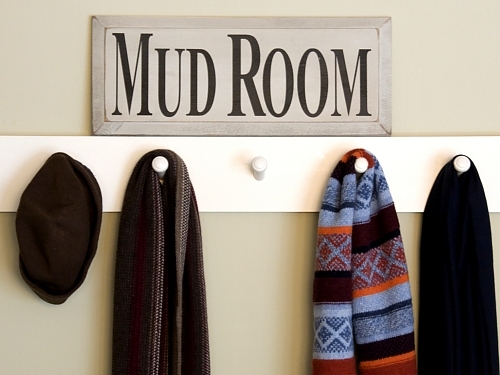 Now you don’t need to have a big mudroom, even a small entryway can be packed with function. When organizing shoes remember to just leave the seasonal appropriate everyday shoes out. Everyday means in the summer sneakers and sandals. The winter boots should be packed away with the winter coats, snow pants, hats, gloves and scarves come April or May. Sandals and flip flops should be put away in the winter. They take up less space so putting them along with dress or church shoes in bedroom closets will work too. Having a central location for everyday shoes is key. Some options are shoe trays, bins or a large basket, over the door shoe organizer or a shoe organizer attached to the wall. Always take advantage of unused wall space. Hooks for the dog leash, car keys or a purse make great use of space. If you have room, a bench that opens up for additional storage is helpful and convenient. Hooks are a big time saver and much more convenient, at least for children, than hanging coats on hangers in a closet. Low hanging hooks help children with self sufficiency. Children like having their own spot. Maybe even label the hooks with their name or designating one hook for COAT and another for BACKPACK. The goal to an organized home is that everything has a place that is both convenient and accessible but also pleasing to the eye.